When you’re talking about universal creation, you have to move into a bigger picture view that goes beyond just one planet, one time frame, and one physical dimension. Whether you’re talking about Christian ideas of heaven and hell, Tibetan descriptions of different realms of existence, new age messages from the “other side,” or various worlds of gods described by the cultures of Greece, Egypt, and India, all these different realms can coexist within the theory of universal creation. 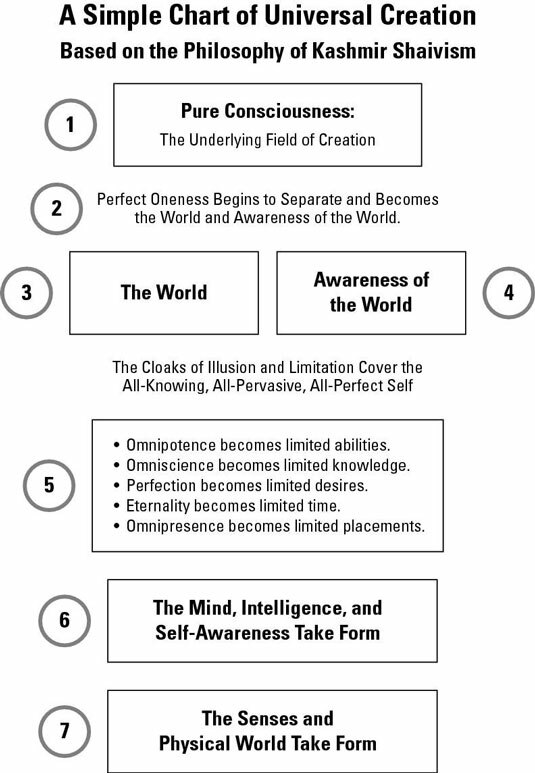 The map, based on the philosophy of Kashmir Shaivism, shows how divine universal Consciousness becomes all the levels of creation, down to the physical world and your experience of it. Even though it may look like a sequential process that moves from supreme consciousness at the top to the physical universe at the bottom, the truth is that the whole chart is happening all at once. Universal Consciousness is always there — pure, eternal, and unaffected by the creation that is described as being projected like a big multidimensional movie upon its screen. And just as a movie screen is unaffected by the nature of the movie being projected on it, so the screen of pure consciousness remains unaffected by all the universal creations that play upon its screen. Don’t worry if you don’t fully understand how this process of universal creation works. Sages from many traditions have spent decades of intense spiritual practices to catch even a glimpse of a higher universal view of creation. Just to come upon elevated spiritual teachings shows that you’ve already achieved a certain resonance with higher truth and are ready to open up to its gifts in a new way. Is this map a perfectly accurate and all-inclusive map of reality? No, of course not. Is there such a thing as an all-inclusive map of reality? No way. If a map were all inclusive, it would not be a map, but the thing itself. Is this graph of universal creation a set of ideas that can open many doors to understanding how the entire universe – including you – can be divine? Yes indeed!